As companies approach a critical size and need to better manage their customer communications, savvy business leaders opt to engage a contact center application to keep a centralized means of communication as customers engage the different channels of communication. For instance a customer inquiry may come in via email, followed by a phone call after which they fax the company some documents followed by a few mailed documents. A good contact center application is able to keep all the disparate forms of communication unified via a single reference to the customer. Any contact center agent is then easily able to access the customer’s file via a single application and assist in resolving any customer inquiry. 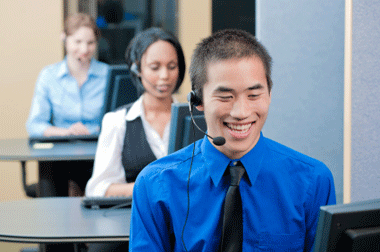 There are many factors that determine which contact center solution will best serve your need. Our whitepapers and comparison charts are here to help you make that difficult decision. Contact center solution buyers can also elect to contact center vendors serving an area to get the ball rolling on gathering important product literature. Vendors are more than willing to send you a barrage of information to help you understand their systems and how they benchmark with their competition.